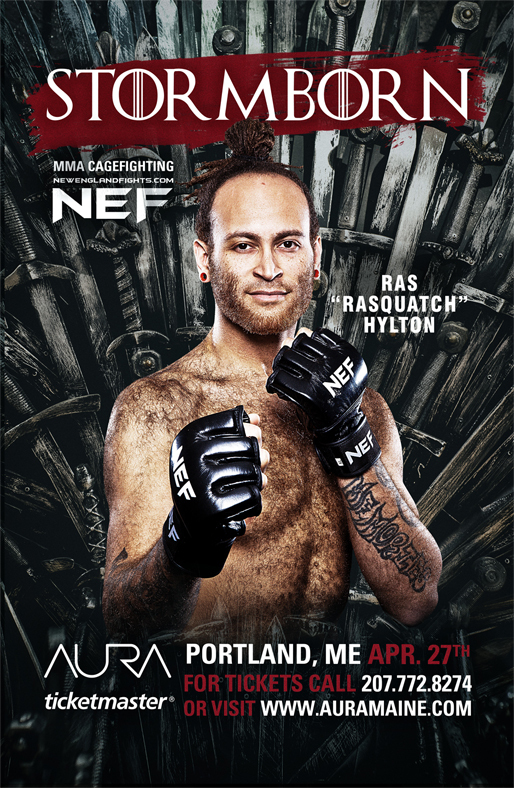 FOR IMMEDIATE RELEASE: Portland, Maine (March 11, 2019) – New England Fights (NEF) heavyweight ‘Rasquatch’ ‘The Jamaican Shamrock’ Ras Hylton (3-2) had a mixed bag of a mixed martial arts (MMA) run in 2018. Hylton recently joined host Jason Floyd on The MMA Report podcast to discuss the ups-and-downs of the last year and his goals for 2019. After losing a fight in New York last May, Hylton rebounded with a beautiful knockout victory over longtime MMA veteran Eric Bedard (6-8) in Rhode Island last August. The win put Hylton in the position to fight Yorgan De Castro for the inaugural NEF Cruiserweight title, a 225-pound division that Hylton has been championing for the widespread adoption of in MMA. De Castro and Hylton shared a wild two-and-a-half minutes in the cage before De Castro ultimately knocked out Hylton to win the title. A lifelong martial artist, Hylton credits his father for putting him on the path that lead to his eventual career choice as a professional fighter. It’s no secret to anyone that has seen Hylton compete in the cage that he prefers the standup aspect of the sport as opposed to the ground game, but when asked why he choose to pursue mixed martial arts competition over boxing, he answered without hesitation. Standing at 6’6”, Hylton has become known for his menacing height as much as he has for his memorable performances in the cage. However, Hylton was quick to note that his height can be both a blessing and a curse when it comes to combat. Hylton’s next fight is set for April 27th when he takes on Charles Penn at “NEF 38: Stormborn” in Portland, Maine. Penn, who fights for Hyaston MMA, will be traveling from North Carolina for the bout.